Sign up for email notifications! We'll shoot you a short email when new updates are added! Click here to subscribe to email notifications. In The Beginning... The chronicles of George and Neal are, for historians, a difficult thing to present. To say that very little is known about both men would be erroneous - in reality, the opposite is true. However, due to certain "chronal anomalies," the direct result of George and Neal's forays into time travel, it therefore becomes nearly impossible to lay out their history in a sequential manner. For example, from 1982 to 1997, George and Neal organized ThimbleCon, an annual meeting of thimble enthusiasts everywhere that didn't actually happen until 2008, when George and Neal were ages 25 and 24, respectively. In 1976, during their respective ages of 35 and 34, they had success as the roller-derby team, "Peaches and CREAM!" ... But which to present first? The 1976 event came second - when they were in their 30s. The 2008 event occurred when the two were in their 20s, however they were in their late 60s when their fascination for thimbles drove them to start organizing the annual event. Much of their lives jump around in this willy-nilly fashion, so much so that most of those dedicated to presenting this information have suffered neurological maladies attempting to present their chronicles. Rather than joining the ranks of the near-mad, this nameless historian has chosen to present this information as the events folded in the heroes' (a.k.a sexual dynamos, as some refer to them) lives. You, Faithful Reader, can now, for the first time ever, vicariously experience the greatness of the Triumphant Two. To say that this website will enhance the lives of billions, and change the world forever, would be an understatement.... But let's begin, shall we? 367 Enlightening Entries & Over 292 Awe Inspiring Images! NEW: Now you can read the whole Saga on your favorite ebook reader! What's better than free ebooks? Well, probably a lot of things, but how can you pass up reading these wonderful adventures for free on your favorite ebook reader? So download the Saga now and take us with you on your next adventure (or to the bathroom, we won't judge you)! And be sure to come back for the latest version of your free ebook! We'll keep updating the free ebooks as we add entries to the Saga! appearance, name and memories as you, who play out every possible permutation of your life choices." "If a universe can be imagined, it exists." During 2003, while involved in their historic "Dare Ya..." competitions, Neal said, "George, I dare ya to create a real life Ziggy," (the adorable, nonthreatening newspaper comic strip character). Neal was deeply satisfied with this dare, as he knew this was an impossible feat. What creature could possibly survive, maintaining such a pudgy, globulous body? Undaunted, George was determined and attempted to create a real life Ziggy. To George's great frustration, experiment after experiment failed. Months passed without success. Ultimately, refusing to concede, George managed to create a fish that looked exactly like Ziggy. That... is a strong likeness. Neal could not deny the strong likeness, but argued George did not create an actual "Ziggy person" therefore failing the challenge (a debate the two have argued over every subsequent "Dare Ya" competitions). In any event, after the competition was over George found the fish a good home - meaning he chucked it over the side of a bridge. Somehow, the fish thrived and even reproduced. Later that year, the fish was discovered by an ichthyologist. While George understood why the scientist named it the "blobfish", he couldn't help but be slightly disappointed the scientist didn't note its resemblance to Ziggy. For many years, the makers of the card game Timeline sought to create a “George and Neal”-centric game. However, given the convoluted and ever-changing history affected by the duo’s chronal exploits, it made creating the game impossible. It was only after the first biography, The Grand Saga of George and Neal’s Adventures Through Time and Space (and Pudding) was published in 2018, that the chronology became clear. The game is probably too easy... I mean, who doesn’t know when George Juice was developed, relative to when those extremely attractive Pleasurebots were created? Now, G&N-ophiles can show off their knowledge by bragging they know when Neal gave his body to science, and whether that was before or after George babysat Metallica’s James Hatfield. Curiously, when the makers of timeline refused to share their profits with George and Neal, it was immediately discovered that an exact identical Timeline game was published 100 years earlier (copyrighted by George and Neal), under the name Timeline: The This Is What Happens When You Won’t Share Profits Edition. Copyrights are meaningless against time-traveling grudge-holders. Why Read For Free What You Can Pay Money For? Then there was the time that the entire George and Neal saga appeared in book purchasable book form, on Blurb.com (http://www.blurb.com/b/8323918-the-grand-saga-of-george-and-neal-s-adventures-thr). Now you, too, can purchase a book, the contents of which can be read entirely for free online! Happy 10th - no wait - 1020th anniversary! 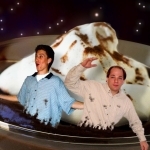 February 2019 marks the 10th anniversary of the Grand Saga of George and Neal's Adventures Through Time and Space (and Pudding)! ....well, February 2019 did originally. Then George took the chronicles to 1009 a.d., to let the masses enjoy such a good saga. He was praised so much there/then, that he decided to continue writing it from that point on, now making February 2019 the 1,020 year anniversary. In 2039 the game Tic Tac Toe had a huge resurgence in popularity when Neal discovered that the game had a hidden Easter Egg, where you could actually play on the lines instead of the squares. This opened up many new strategies, that for centuries, had been hidden and remained unexplored. In order to cash in on the Tic Tac Toe hype, George partnered with Ferrero SpA candy company on a new line of candy. Tic Tac Toes were less popular than their minty counterparts, but they sold reasonably well for most of the next decade. This was the variety pack. Some of the most popular flavors, like Hyperhidrosis, Corns, and Burst Blister, came in their own packaging. ... but every change is not categorically a good one. George's biggest regret is that now most of the world uses the "Gold Standard". Previously, the world used the much more reliable and sensible "Muppet Standard." On the reverse side of the coin: "C is for Currency, and that's good enough for me!" Although memory of the Muppet Standard has mostly faded from George's memory, he still recalls buying a hot chocolate one cold morning, handing over four Miss Piggies, and still getting a few Rolfs back. Things were cheaper back then. In 2018 George's third kid served as inspiration to his greatest gift to the human race. He noticed that Andrew was very mobile and kept having problems with his diaper shifting into odd positions. Additionally, diapers are really not all that stylish. So he worked with leading fashion designers (but mostly Neal and Sisqo) to come up with a new design for the traditional nappy. Since then Thong Diapers have become all the rage and have changed the course of history. Seventh Generation was the first company to jump on board with this civilization changing revolution in diaper design. Less material in the diapers means they're much more environmentally friendly. Maybe not for your immediate environment, but overall they really helped.